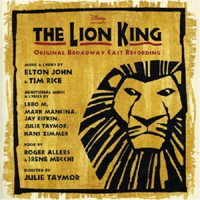 Original Broadway Cast, 1997 (Walt Disney Records) (4 / 5) The Lion King is more than a musical; it’s a juggernaut. This time, Disney didn’t follow the route it had taken with Beauty and the Beast, the Broadway version of which was mostly a replication of the film with a few extra songs. Instead, Julie Taymor directed a show packed with visual splendor that creatively reimagined and expanded upon the movie of The Lion King and won the 1998 Tony Award for Best Musical. Elton John and Tim Rice’s pop-hit songs from the film are thrillingly performed here; they sit very well next to the new songs that the team wrote for the stage show, and some additional material by other writers. The sense of stylistic unity is aided by lush orchestrations by Robert Elhai, David Metzger, and Bruce Fowler that utilize authentic African rhythms and instruments. 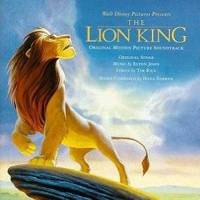 “Circle of Life” and “Can You Feel the Love Tonight?” retain their effectiveness, though their presentation here differs somewhat from that of the film’s soundtrack. “Hakuna Matara” is charmingly performed, and Geoff Hoyle as Zasu does a clever new number, “The Morning Report.” The best of the additions are “They Live in You” (sung by Samuel E. Wright, reprised by Tsidii Le Loka) and “Shadowland” (sung by Heather Headley). One quibble, which applies to many cast albums these days: The rough edges of a live performance have been so thoroughly smoothed over in the studio that the whole thing is an inch short of freshness. But that’s a relatively small complaint about this glorious audio souvenir of an enchanting Broadway perennial. — M.S.